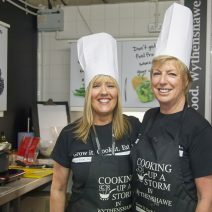 The team run ‘Emmie’s Kitchen’ from McDonald House once a month, where they showcase healthy recipes and cook them for the people staying at the facility; which offers free 'home away from home' accommodation to families with children receiving treatment in the Royal Manchester Children's Hospital and St Mary's Neonatal Unit. McDonald House is open 365 days a year and is equipped with everything you would find in a family home. It gives families the chance to get a good night's sleep and prepare their own meals knowing that they're only a moments away from their children.